After several hours of list making, link finding and price figuring, here is the resource I’ve been promising for such a long time! I’ve tried to include everything that typically can be found in my fridge, freezers, pantry and bulk storage. 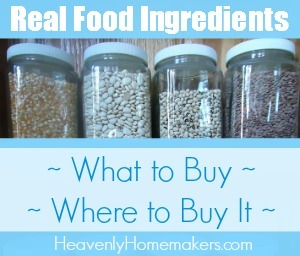 I obviously don’t have all of these items on hand all of the time, but I do try to keep a good stock of most of these items so that I am flexible to put together a variety of healthy meals, as well as open our home to guests frequently. I buy almost all of the listed items in bulk quantities because I know we’ll use it. I also try to purchase just about all of the items in this list in organic form if possible. Because you are all reading from different locations, I also recommend that you read through the comments on this post in order to find a health food co-op or whole food resources in your area. Also, check out LocalHarvest to find meat, milk, eggs and produce in your area. Hopefully the linking system I used in each section is user friendly! If I linked to Tropical Traditions, Vitacost, Amazon, Azure Standard, or Mountain Rose Herbs, I tried to link each item to the specific product page on those sites for easy navigation. In addition to the following products, occasionally I make butter and mozzarella cheese, if I have enough milk/cream/time. Butter – I usually purchase a case of Willow Made Sweet Cream, Unsalted Butter from Azure Standard. The case lasts us 2-3 months and averages to be $3.50/pound. Cheese – I purchase raw organic Landmark white cheddar cheese from Azure Standard. It is $5.47/pound if purchased by the case. I purchase most of my grass fed beef and free range whole chickens from a local farm – NorthStar Neighbors. Occasionally, I will get it from Tropical Traditions if they have a great sale. Chicken Breasts – I typically purchase Smart Chicken brand when it’s on sale at our local grocery store for $3.oo/pound or less. Tuna (canned) – I buy Natural Value Yellow-Fin by the case either from Amazon or Azure Standard, shooting for $1.50/can or less. Frozen Fish, sometimes – I live in Nebraska, what can I say? We don’t have fresh fish here. I don’t necessarily trust frozen fish from a regular grocery store, but occasionally I will buy some tilapia or salmon. Hard White Wheat – I buy this in bulk through a big Wheat Montana truck load drop off organized by a friend or from Azure Standard – $0.42/pound. 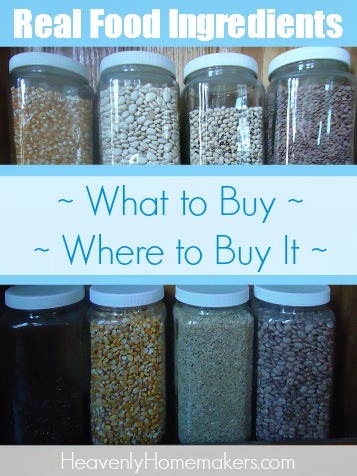 I sometimes have Kamut, Millet, Buckwheat, Spelt and/or Barley on hand – purchased from Azure Standard or Tropical Traditions – all less than $1.00/pound. Coconut Flour – Azukar Organics through Amazon (best price!) or Tropical Traditions when it’s buy one get one free – $3.50/pound or less. Vanilla Extract – I make my own; read how you can too! These are purchased either from Tropical Traditions, Azure Standard or Mountain Rose Herbs. I didn’t link to any specific site for these – where I buy these depends on who has the best price at the time. Salad Dressings – I make my own, recipes are found here. Green Beans, Sweet Corn, Peaches, Strawberries, Applesauce – we grow or buy from local farmers and preserve these ourselves each year.